6 of the best Gantt chart software ranked. Read the blog to find out more. You might be a project manager or someone from management who wants a bird’s eye view of all your team’s progress. When it comes to visualizing this progress, there is nothing as effective as a project’s Gantt chart. How to make a Gantt chart? There are lots of ways. The most effective way is to use a Gantt chart software or a task management tool that offers the ability to make one. Usually, Gantt charts are included in project management applications, such as Paymo or Jira. If you’re using a project management software that does not offer built-in Gantt charts, chances are it might be providing a third-party integration for you to do so. There are a lot of these integrations available, which we will cover later. Examples of such integrations are InstaGantt for Asana and BigGantt for Jira. You can also use templates available for Microsoft Excel. These templates provide you with a table using which a Graph is being generated on the spreadsheet. However, these templates might not be the best way to visualize project progress, especially when you’re dealing with big projects that involve complex workflows, sprint cycles, and constant to-the-minute updates. Plus, with Gantt chart templates for Microsoft Excel, you do not get to leverage task management. In this article, we help you identify the best Gantt chart software that can match your needs. Liquid Planner’s approach towards project management is unusual and new in the market. Unlike many other famous task management and project management apps, Liquid Planner focuses primarily on task prioritization. It is at the top of our list of the best Gantt chart software and is the Editor’s Choice due to various reasons. Liquid Planner comes with built-in functions such as resource leveling and predictive resource scheduling, which are not only great for small teams but also serve enterprise needs. The simple, elegant interface makes it easier to keep an eye on all your projects. Let’s talk a bit more about the predictive scheduling function of Liquid Planner. It is a predictive algorithm with priority-based scheduling that automatically predicts resource availability and the time it will take for tasks to complete. The algorithm calculates this based on best-case and worst-case scenarios. 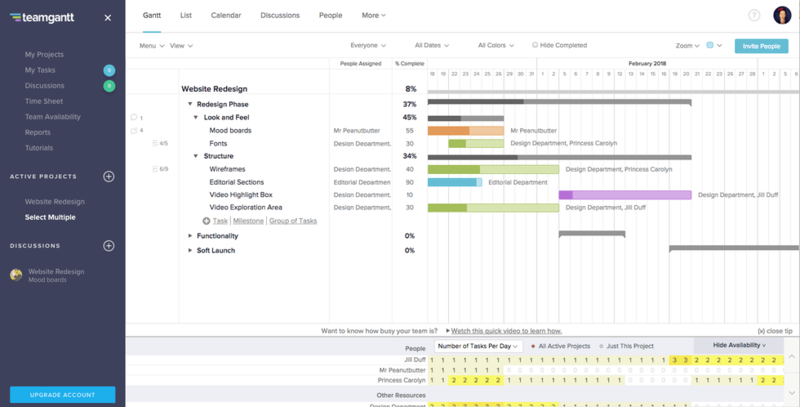 That’s an excellent feature for someone who is new to project planning and scheduling. Professional – starting at $45 per user per month for teams of 5 people (minimum) on an annual billing cycle, all the essential features included. Enterprise – starting at $69 per user per month for teams of 5 people (minimum) on an annual billing cycle, advanced features included. TeamGantt makes it to the 2nd spot on our list of the best Gantt chart software and programs. It is a stress-free experience managing project timelines and scheduling tasks within this tool. The app really takes only a couple of minutes for any team to get started. It’s easy to set up and everyone can start using it right away. Signing up for TeamGantt gives you 30 days of unlimited access, so you can really test this Gantt chart software out before you decide to invest in it. After the 30 days, you can either upgrade by paying or use the Free plan on TeamGantt, which does come with a few limitations. With the Free plan on TeamGantt, you don’t get hourly estimating and resourcing tools, custom project templates, project history, some key time-tracking features, and more. Guest access to Gantt charts is also not offered on the Free plan. Standard Team – starting at $49.75 per month for teams of 5 people on a monthly billing cycle, some features missing. The annual plan costs $39.50 per month. Advanced Team – starting at $74.75 per month for teams of 5 people on a monthly billing cycle, all features included. The annual plan costs $62.25 per month. You might already be familiar with GanttPRO. It is one of the world’s leading team collaboration, scheduling and Gantt chart tools. With over 350,000 people on the platform, GanttPRO is definitely a safe bet. 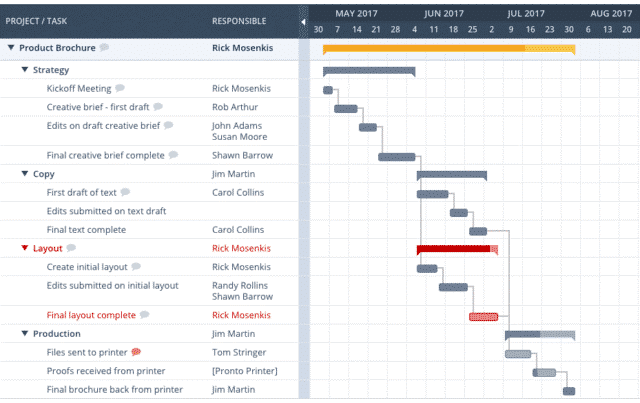 Tasks, subtasks, milestones, dependencies, progress tracking, cost estimations, prioritization, and more – all within one comprehensive Gantt chart software to visualize team progress. There is also a built-in workload tracking and management module, which shows if anyone on your team is over- or under-burdened. GanttPRO also provides a bunch of templates to give you a headstart. Whether you’re a software development team, or you have a product launch coming up – the templates are nicely defined and are great help to get you started. Our 4th recommendation for the best Gantt chart software is Wrike. Now, most of us are already familiar with this one. However, Wrike offers everything to be stored as folders and subfolders, so it might not be the best fit for your needs to manage projects if you are looking for a Project > task > subtask kind of workflow. Wrike is an extensive project management software used by large teams and organizations for complex project management requirements. With the ability to cater to all these complex requirements, comes complexity within the tool’s interface. Wrike is not easy to navigate, and onboarding for the team might become a little challenging. However, since it is one of the most comprehensive project and portfolio management solutions in the market, you can easily depend on the platform with all your needs, including your need to integrate Gantt chart software within all your projects. Professional – at $9.80 per user per month on an annual billing cycle. Added features and functions, for teams of 5-15 users. Gantt charts included. Business – at $24.80 per user per month on an annual billing cycle. For teams of 5-200 users. Added features for custom branding and reporting. Gantt charts included. Wrike for Marketers – at $34.60 per user per month on an annual billing cycle. For creative and marketing teams of 5-unlimited users. Includes Gantt charts, proofing and approval tools. Enterprise – custom pricing, contact for inquiry. Advanced security and controls. For teams of 5-unlimited users. Gantt charts included. Easy Projects is a great project management software used by teams of all sizes to collaborate together. Their website states that it can “Replace the mess of spreadsheets, emails and whiteboards with a simple workspace…”, which is true. Easy Projects is simple, and it works well with everyone. It offers an interactive Gantt chart tool, which you can use to not only visualize team progress but also manage and delegate work. 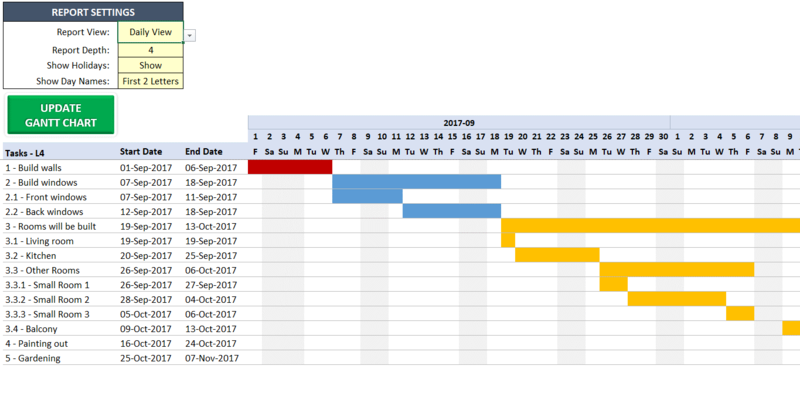 The visual interface for this Gantt chart software gives you an accurate picture for each task; when it started, how long it remained in progress and exactly when it was completed. It also highlights task dependencies, that are critical for a project lifecycle. 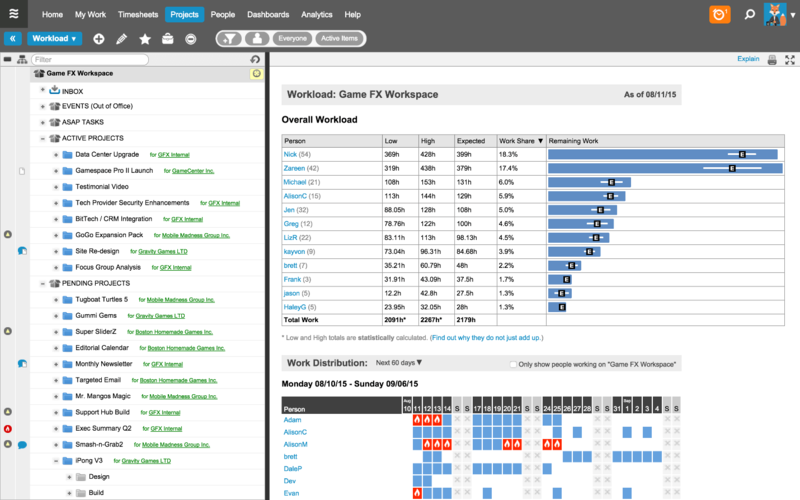 Workzone is another great tool for collaboration that integrates Gantt chart software into all of its project views. It includes a project dashboard where users can easily view the projects listed by other team members, start and end dates, task statuses, percentage of completion, and more. Another great feature that comes with Workzone is its templates. You can set up your project or task once, and save its template to repeat later. This saves a lot of time. There is also a master group calendar to track deadlines across all tasks on all projects, which is a relatively specific requirement for enterprise users having to oversee a lot of tasks and projects simultaneously. Workzone ranks #6 on our list of the best Gantt chart software. Enterprise – all essential and advanced features, including SSO, workspace groups, etc. So, that was it. 6 of the best Gantt chart software available today. Which tool did you like the most? Do you have another tool you’d like to see included in this list? Let us know in the comments below and we’ll review it. Thanks for the roundup, Steve. Let me expand your list a little. 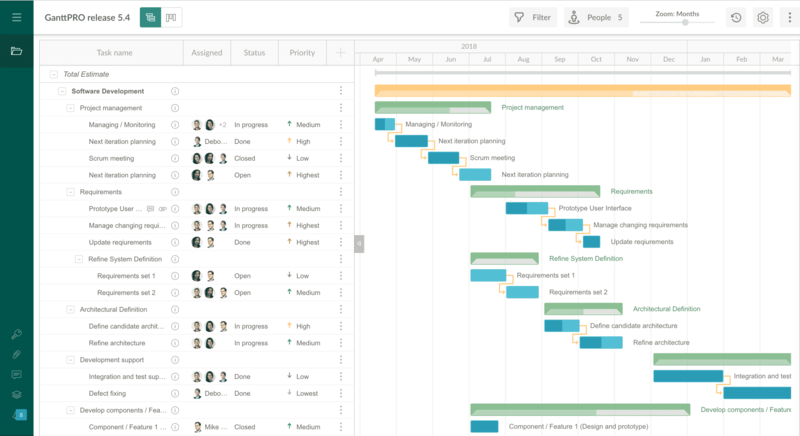 I would also like to pay your attention to GanttPRO, an online Gantt chart software. This is a robust project management tool that helps to manage tasks, resources, and workload, track progress, collaborate with your team, etc. Hopefully, you will take a chance to review it and include it in your list as well.